Pictured are (seated from left) Community Participation Manager Connie Hinger, Administrative Assistant Pam Mendoza, Assistant City Manager Kathy Matsumoto, Public Information Manager Laurie Kajiwara, City Clerk Vida Barone. 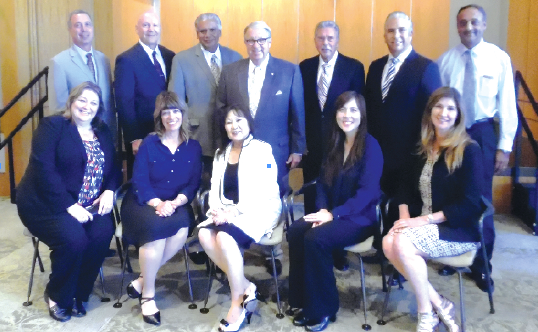 Top row (l-r) City Attorney Mark Steres, Community Safety Manager Daryl Evans, Assistant City Manager Vince Brar, L.A. County Supervisor Don Knabe, City Manager Art Gallucci, Community Development Director Torrey Contreras, Public Works Director Kanna Vancheswaran. Photo courtesy city of Cerritos. The Cerritos Mayor and City Council as well as Staff and Cerritos Commissioners gathered for a recognition reception for Supervisor Don Knabe this past June 9th, 2016, held at the Cerritos Library. During the council meeting, a video was shown commemorating Knabe’s term as Mayor and Councilman for the City from 1980 to 1988. Knabe’s dedicated efforts on behalf of this region has stimulated the economic development, increased funding for law enforcement, and resulted in renewed youth literacy and arts enrichment programs. Local families appreciate the Knabe Fishing Derby, held for the last 20 years.